This year we're proud to be working with renowned designer Carol Feller and Fyberspates on their Knit-A-Long. The sweater that Carol has designed is called the Mithral Sweater. It is as light as air but surprisingly warm, well fitted and looks Terrific. You’ll never want to take it off! It’s knitted from Fyberspates Cumulus yarn which is a blend of alpaca and silk. It has got a great halo which means that it can comfortably be knit at a loose gauge and the yarn fluffs up to fill the space. This sweater is knit from the top down with set-in short row sleeves, with gentle a-line body flowing from below the empire waist which flatters most body shapes. The sweater comes with several different neckline options. 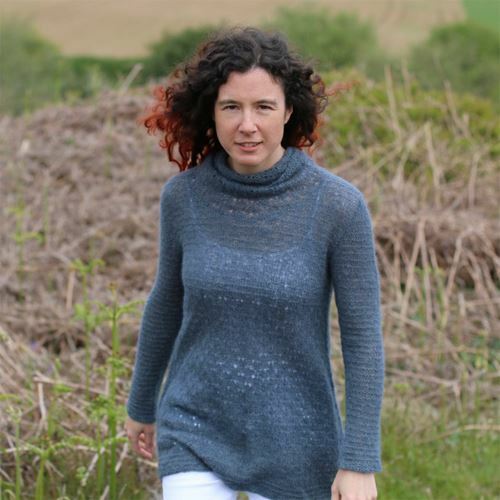 Pictured is the cowl neck option but instructions will also be given for a rounded or a scooped neckline.